About 2,200 years before the birth of Messiah, Noah’s great grandson, Nimrod along with his wife Semiramis, built the Tower of Babel (Genesis 10:10, 11:9) and the Babylonian Empire which combined their pagan religion with their form of government. They worshiped the stars, sun, and the moon, and they sacrificed their babies to Moloch (satan). Nimrod in an attempt to become “God” declared himself the god of the sun and Semiramis was the goddess of the moon (also known as the “Queen of Heaven”) and the people of the Babylonian Empire worshiped them as such. The story goes that Noah’s son Shem was so angry about this, that he had Nimrod killed and his body parts were delivered to different provinces within Babylon as a warning to those who worshiped Moloch. After he died, Nimrod’s wife wanted to keep this false pagan religion alive in order to keep the people of the land under her rule and reign. So, she consulted her astrologers who told her that on December 22nd the sun is the furthest away from the earth, but on December 25th, the sun is “born-again.” This is known as the “winter solstice” in paganism. Semiramis became pregnant on March 25th (Easter/Ishtar), which is called the spring equinox in paganism. But, she told the Babylonian people that Nimrod had impregnated her, with the rays of the sun (since he was the sun god). Exactly 9 months later on December 25th, she gave birth to a son and named him Tammuz (Ezekiel 8:14). She told the Babylonians that Tammuz was a reincarnation of Nimrod the “sun-god” born on December 25th. Some stories say that Semiramis then ordered the Babylonians to go into the forest and cut down a tree and decorate it with balls. This custom was meant to commemorate Nimrod who was “cut down” like a tree. Others say that she claimed a full grown evergreen tree sprang up overnight from a dead stump and was in fact a reincarnation of Nimrod himself. Then every year on his birthday (Dec 25th) he would visit that tree and leave gifts. Either way, we know that evergreen trees have long since been a part of pagan worship. We also know that Elohim hates this idolatrous practice which is why he warned the children of Israel not to learn this custom from the pagans in His word. Throughout the following centuries the pagan religion of sun worship continued and spread widely. 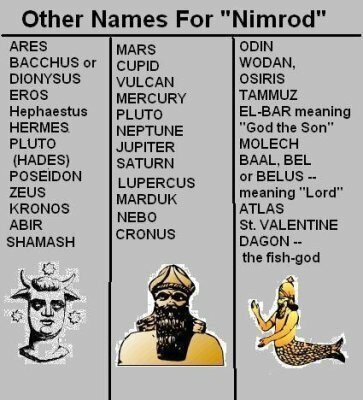 Nimrod the god of the sun took on several different names and personas in different areas of the world. The rituals and festivities surrounding the “winter solstice” may have varied between the people groups and from land to land, but at its root it was all the same pagan religion created by Nimrod and Semiramis. 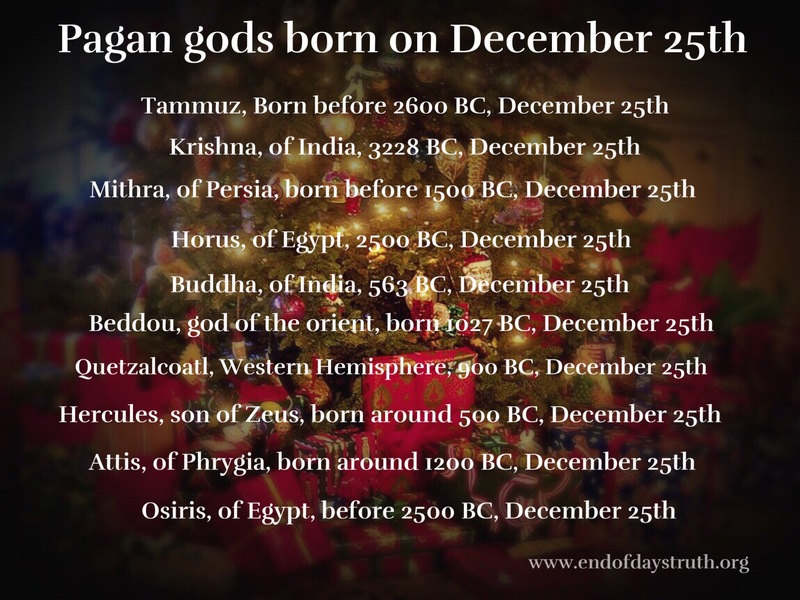 Pictured here are just some of the many pagan god’s since the days of Nimrod who are said to all born and/or reincarnated on December 25th . “Yet there was also another pagan belief during this same epoch, that much more nearly competed with Christ for the control of the Western world. This was the cult of the Sun, which was revered by millions of the inhabitants of the Roman Empire, and its religion for a time even became the state worship….”In Rome, the divinity of the Sun came very early on; and then, centuries afterwards, in the superb dome of Hadrian’s Pantheon, the central opening, surrounded by star-like rosettes, represented the solar orb….Before long, the emperor Aurelian established a massive temple of the Unconquerable Sun as the central and focal point of the entire religious system of the state (274). The birthday of the god was to be on December 25, and this, transformed into Christmas day, was one of the heritages that Christianity owed to his cult” (p. 391- 392, emphasis mine). So, we see (and will explore more in depth below) that Christianity took over the birthday of the sun god, the cult of the sun, and transformed it into CHRISTMAS DAY, the “birthday” of the Messiah! When in reality it was birth day of the pagan sun god, worshipped for centuries by millions throughout the Roman Empire. ‘Saturnalia’ was one of the ancient Roman festival honoring the deity of Saturn that was observed during the winter solstice. This holiday was celebrated with a sacrifice at the Temple of Saturn in the Roman Forum and a public banquet, followed by private gift-giving, continual partying, and a carnival atmosphere that overturned Roman social norms. “An old Roman festival played a major part in the choice of this particular day. December 25 in ancient Rome was the ‘Dies Natali Invictus,’ ‘the birthday of the unconquered,’ the day of the winter solstice and at the same time, in Rome, the last day of the Saturnalia, which had long since degenerated into a week of unbridled carnival…” (p. 331). The popularity of Saturnalia continued into the 3rd and 4th centuries AD, until the Roman Empire came under the rule of Constantine who proclaimed, for political reasons to become ‘Christian’. But as the head of the empire, he was concerned about the unity, coherence and stability of the people so he sought to reconcile, blend and mesh pagan practices with ‘Christian’ beliefs. Along with many other changes he made such as changing the day worshiped as the Sabbath to “Sun”day this is also when December 25th celebrated as the birth day of many pagan gods, was declared to be the birth day of Messiah and observed as such. “then Christianity was enthroned” “…the establishment of Christianity as the state religion became a CURSE.” “Everybody sought membership in the church, and nearly everybody was received. Both good and bad, sincere seekers after God and hypocritical seekers after gain, rushed into the communion. Ambitious, worldly, unscrupulous men sought office in the church for social and political influence…. ‘The services of worship increased in splendor, but were less spiritual and hearty than those of former times. The forms and ceremonies of paganism gradually crept into the worship. Some of the old heathen feasts became church festivals with change of name and of worship.” (p. 74-75, 79 emphasis mine). During this time is also when the pagan statues (idols) which adorned the Roman Empire were changed from gods such as “god of Saturn” to Saint Peter and the Moon goddess (also known as Semiramus and/or Ishtar) became Mary, the mother of Messiah. “…the god Christ was assimilated to the religious and philosophical traditions of the Hellenistic mind. Now the PAGAN WORLD — even the anti-Semitic world — could accept him as its own. “Christianity did not destroy paganism; it adopted it. The Greek mind, dying, came to a transmigrated life in the theology and liturgy of the Church…the Greek mysteries passed down into the impressive mystery of the Mass. … Christianity was the last great creation of the ancient PAGAN world” (p. 595). This also leads us to the truth of where we get the name Christmas or Christ-‘Mass’. Catholics believe this Mass performed continually sanctifies the one taking part in it. Catholicism is a works based religion, not believing that the work Messiah did on the cross was enough to fully atone for the sins of man and their Mass is part of their false rituals rooted in pagan beliefs. If we are to abhor the thought of our Messiah and Savior’s very Body and Blood being partaken by a congregation, and for the Sacrifice of Calvary to be renewed time and time again as the Roman Catholic church sees to it, why do we delight in the celebration of Christ-Mass? As we see here, the Roman Catholic Church under the rule of Constantine took an already pagan holiday December 25th, a worship of the sun god (in many names and forms) and made it what Christians now call “Christmas”. 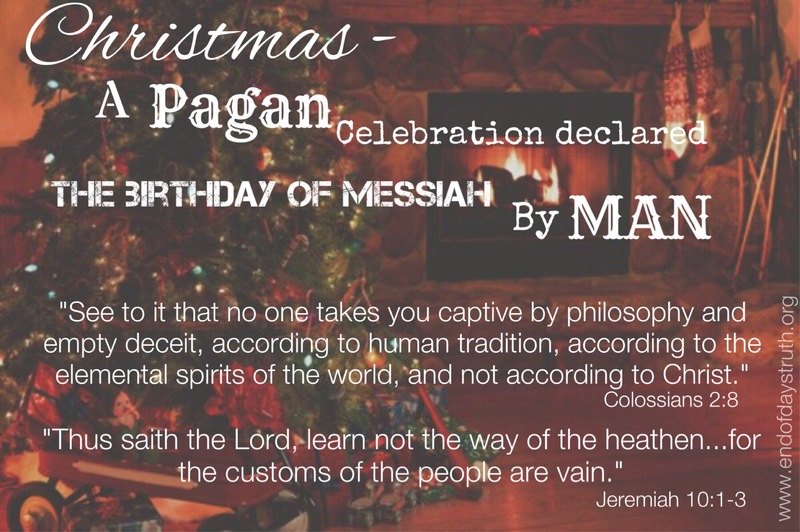 There was absolutely no authority given by Elohim for His followers to celebrate the birth of His son, the Messiah much less merge it with a day that throughout the early centuries was well known to be the birth day of numerous pagan gods. In Part III, we will dig deeper into the word of Elohim and see just how our Creator feels about using pagan ways to worship Him.